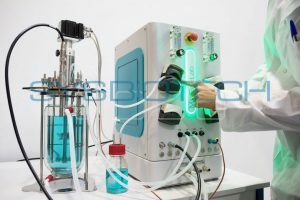 Basic MINIPRO-LABTM system consists of a PC/HMI with C-BIO2™ operator and control software, a fermenter vessel and a MINIPRO-LAB™ controller unit, which can control one (1) vessel. 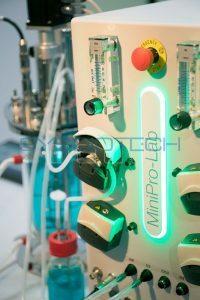 MINIPRO-LAB™ controller is a fully functional controller designed for fermentation and cell culture applications for process research and development work. 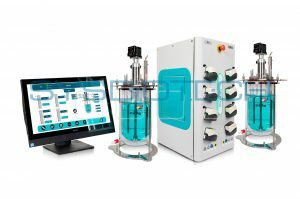 MINIPRO-LAB™ design and configuration is flexible and can be configured to meet your specifications. 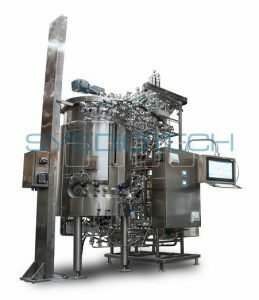 A PLC, incorporated in the MINIPRO-LABTM controller, collects the measured quantities and ensures the correct operation and precision of the control loops. The human/machine interface is installed on a separate device and communicates via Ethernet with the controller’s PLC to exchange the main data. 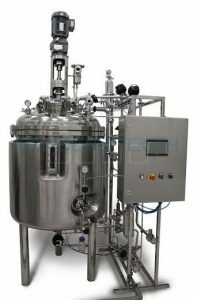 To withstand extreme temperature conditions (autoclave), the agitators are equipped with a sealing system to keep the inside of the vessel sterile. 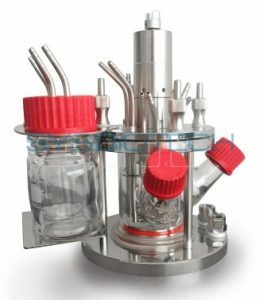 Up to 8 parameters can be controlled per vessel: Agitation, Temperature, pH, pO2, Antifoam, level, Redox, Optical Density, etc., so you can choose the parameters required for the perfect realization of your batch, fed-batch or perfusion process. 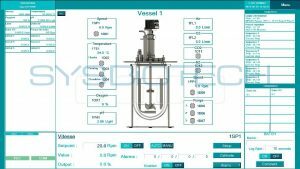 The peristaltic pumps, the rotameters and the pneumatic fittings for the vessels and instruments also located on the front of the controller. A visual indicator (red or green light) informs you that the machine is operating correctly and warns you in real time of any malfunctions. 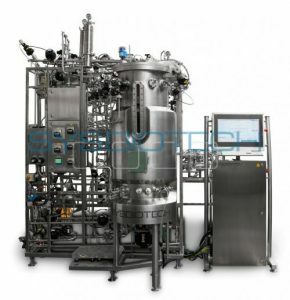 The entire machine has been designed to be simple and intuitive to use. An emergency stop button is included, located on the front of the controller.